I received Solo: A Star Wars Story for this feature. Opinions expressed are my own. Lucasfilm?s Solo: A Star Wars Story, directed by Academy Award?winning filmmaker Ron Howard, is an action-packed journey that explores Han?s first encounters with future friend and copilot Chewbacca (Joonas Suotamo) and notorious gambler Lando Calrissian (Donald Glover). 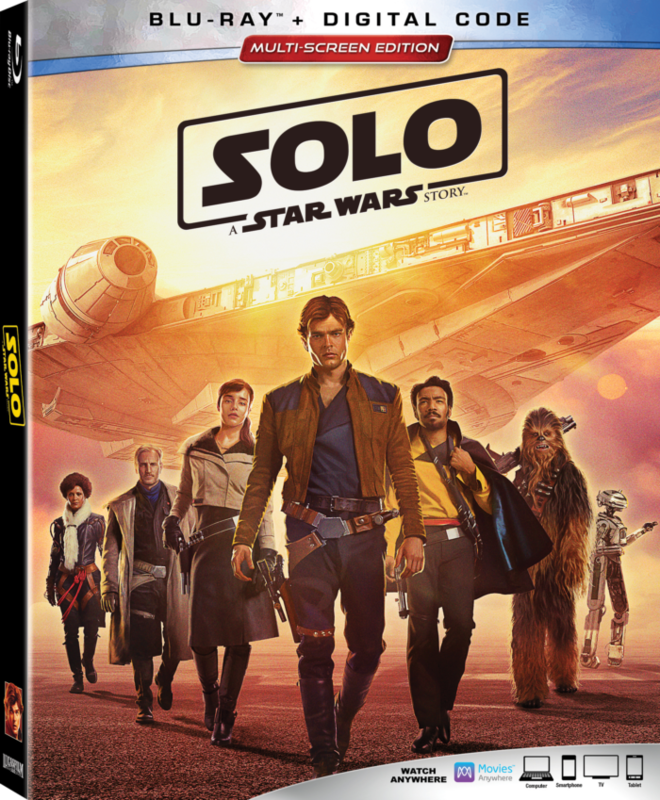 Watch instantly on September 14th as the Millennium Falcon sets course digitally in HD and 4K Ultra HD and on Movies Anywhere, and bring the adventure home on Blu-ray 4K Ultra HD, Blu-ray, DVD and On-Demand on September 25th. Directed by Ron Howard, the fun-filled galactic heist movie stars Alden Ehrenreich (?Hail, Caesar!,? ?Tetro? ), Woody Harrelson (?Three Billboards Outside Ebbing, Missouri,? ?The Messenger? ), Emilia Clarke (?Me Before You,? ?Game of Thrones? ), Donald Glover (?Spider-Man: Homecoming,? ?The Martian? ), Thandie Newton (?Gringo,? ?Crash? ), Phoebe Waller-Bridge (?Fleabag,? ?Killing Eve?) and Paul Bettany (?Captain America: Civil War,? ?Master and Commander?). Joonas Suotamo (Star Wars: The Last Jedi) returns to play Chewbacca. Written by Jonathan Kasdan & Lawrence Kasdan, ?Solo: A Star Wars Story? is produced by Kathleen Kennedy, Allison Shearmur and Simon Emanuel. Lawrence Kasdan, Jason McGatlin, Phil Lord and Christopher Miller are executive producers. To create the unique look of the film, some of the industry?s top talent was recruited, including Academy Award? nominee Bradford Young (?Arrival? ), director of photography; two-time Academy Award?winning editor Pietro Scalia (?Alien: Covenant? ); Dominic Tuohy (?The Mummy? ), special effects supervisor; Rob Bredow (?Cloudy with a Chance of Meatballs? ), visual effects supervisor; and John Powell (?Jason Bourne? ), score composed and adapted by. The legendary John Williams is credited with the ?Han Solo Theme? and original Star Wars music. Solo: The Director & Cast Roundtable -Sit down with director Ron Howard and the stars for an intimate and entertaining discussion of the film?s making. Team Chewie – See what it takes to bring your favorite Wookiee to life in this lighthearted look behind the scenes. Kasdan on Kasdan – Iconic Star Wars screenwriter Lawrence Kasdan and son Jonathan share what it was like to write the movie?s script together. Remaking the Millennium Falcon – Track the transformation of the most famous ship in the galaxy, from Lando?s swank and impeccable pride and joy to Han?s stripped-down hot-rod freighter with ?special modifications.? Becoming a Droid: L3-37 – Meet the newest droid?and the talented actor who helps bring her to life. The Millenium Falcon: From Page to Park ? An exclusive look at the history of the most famous ship in the galaxy, its origin and development, and how it will translate in one of the most anticipated expansions in Disneyland?s history. To celebrate the release of ?Solo: A Star Wars Story,? 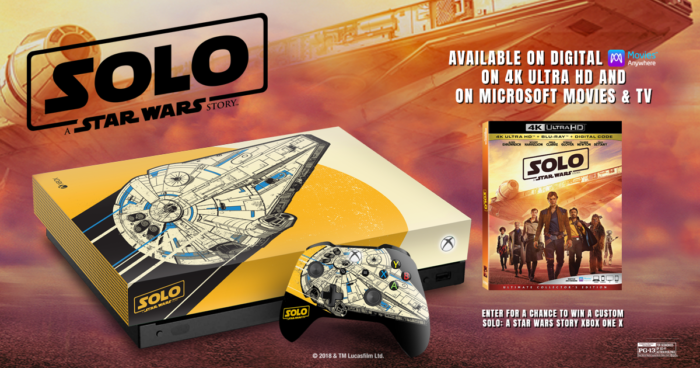 Lucasfilm and Xbox are excited to announce the Xbox One X Solo Custom Console Sweepstakes! from now until September 30, 2018. Open to U.S. and Canadian (excluding Quebec) residents only. As a lifelong Star Wars fan I can honestly say that Solo: A Star Wars Story pleasantly surprised me! I was worried the story lines would not line up but I was so wrong! Hon’s character was as charismatic as ever and seeing the origin of him and Chewy was nothing short of perfection. I think the best performance would be from Donald Glover as Lando as he felt so true to the original trilogy. Big Sis is 9 and new to the Star Wars universe but she LOVED this movie and was happy to see his origin story. Make sure to watch through all the bonus features and deleted scenes especially The Train Heist as it is so amazing to see how scenes are designed, shot and put together. Solo: A Star Wars Story is an absolute MUST-SEE for every single Star Wars fan out there! Add this one to your movie collection and watch how these space BFFs ended up together! Connect: You can connect with Star Wars on Facebook, YouTube, Instagram and Twitter.